Low-income advocates question disruption to health care, future shift of tax burden from wealthy to middle-class. (Francisco Kjolseth | The Salt Lake Tribune) Bonnie Mitchell who has Ehlers Danlos Syndrome, an inherited connective tissue disease lends her voice to speak out over the current tax plan being discussed that eliminates the deception for medical expenses and long term care. A group of Utahns gathered to rally at the Wallace Bennett Federal Building in Salt Lake on Monday, Nov. 20, 2017, to tell personal stories of how they might be impacted by the tax reform plans currently on the table in Congress. 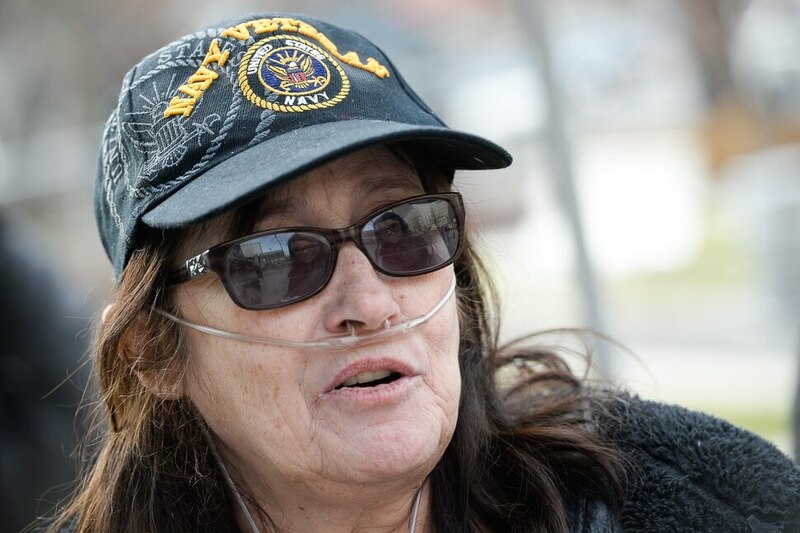 (Francisco Kjolseth | The Salt Lake Tribune) Penny Larsen, a disabled Navy veteran, is concerned with the House plan that eliminates the Work Opportunity Tax Credit (WOTC), which gives employers incentives to hire disabled veterans. 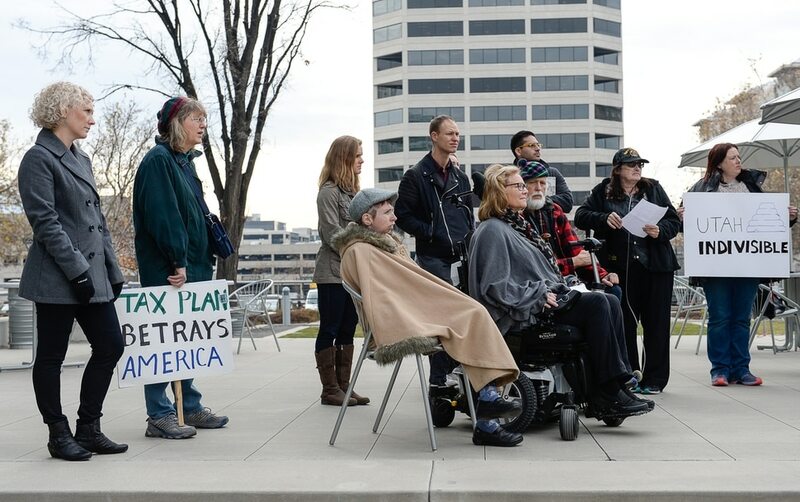 A group of Utahns gathered to rally at the Wallace Bennett Federal Building in Salt Lake to tell personal stories of how they might be impacted by the tax reform plans currently on the table in Congress. (Francisco Kjolseth | The Salt Lake Tribune) A group of Utahns rally at the Wallace Bennett Federal Building in Salt Lake on Monday, Nov. 20, 2017, to tell personal stories of how they might be impacted by the tax reform plans currently on the table in Congress. (Francisco Kjolseth | The Salt Lake Tribune) Cameron Wallace, 5, Ken Whitaker and Thea Brannon, clockwise from bottom, join a group of Utahns to rally at the Wallace Bennett Federal Building in Salt Lake to tell personal stories of how they might be impacted by the tax reform plans currently on the table in Congress. (Francisco Kjolseth | The Salt Lake Tribune) Emily Jessop, a first-generation college student at SLCC, is facing a House tax plan that repeals the student loan interest deduction. A group of Utahns gathered to rally at the Wallace Bennett Federal Building in Salt Lake on Monday, Nov. 20, 2017, to tell personal stories of how they might be impacted by the tax reform plans currently on the table in Congress. (Francisco Kjolseth | The Salt Lake Tribune) A group of Utahns rally at the Wallace Bennett Federal Building in Salt Lake to tell personal stories of how they might be impacted by the tax reform plans currently on the table in Congress. (Francisco Kjolseth | The Salt Lake Tribune) A group of Utahns rally at the Wallace Bennett Federal Building in Salt Lake on Monday, Nov. 20, 2017, to tell personal stories of how they might be impacted by the tax reform plans currently on the table in Congress. 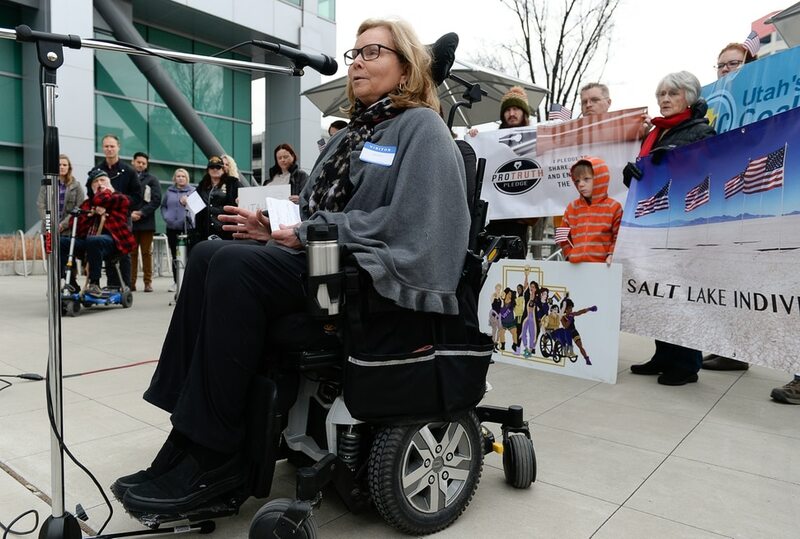 (Francisco Kjolseth | The Salt Lake Tribune) Bonnie Mitchell who has Ehlers Danlos Syndrome, an inherited connective tissue disease lends her voice to speak out over the current tax plan being discussed that eliminates the deception for medical expenses and long term care. A group of Utahns gathered to rally at the Wallace Bennett Federal Building in Salt Lake on Monday, Nov. 20, 2017, to tell personal stories of how they might be impacted by the tax reform plans currently on the table in Congress. (Francisco Kjolseth | The Salt Lake Tribune) Lindsy Cieslewicz, a Heber mother of 6 children expresses her concern over the current tax proposal that eliminates personal exemptions and increases the standard deduction and the child tax credit. A group of Utahns gathered to rally at the Wallace Bennett Federal Building in Salt Lake on Monday, Nov. 20, 2017, to tell personal stories of how they might be impacted by the tax reform plans currently on the table in Congress. (Francisco Kjolseth | The Salt Lake Tribune) A group of Utahns rally at the Wallace Bennett Federal Building in Salt Lake on Monday, Nov. 20, 2017, to tell personal stories of how they might be impacted by the tax reform plans currently on the table in Congress. (Francisco Kjolseth | The Salt Lake Tribune) Pedro Rico, a student at Salt Lake Community College expresses his concern over the House tax plan that repeals the student loan interest deduction. A group of Utahns gathered to rally at the Wallace Bennett Federal Building in Salt Lake to tell personal stories of how they might be impacted by the tax reform plans currently on the table in Congress. First, Bonnie Mitchell used her savings. Then she took out a second mortgage on her Salt Lake City home. When that wasn’t enough, she began draining money out of her retirement account. Now, five years since the car crash that crumpled her spine like a baseball bat hitting a tower of Legos, the bills keep coming. After the fender bender, doctors discovered that Mitchell has a rare genetic disease that causes joint dislocations and compounded her injuries. The 66-year-old former law professor rolled her wheelchair to a microphone stand outside of Sen. Orrin Hatch’s Utah office Monday morning to share that experience in voicing her opposition to the tax-reform bill he helped draft. Mitchell’s fear is that the legislation would eliminate the medical-expense deduction, as well as the individual health-care mandate under Obamacare that requires most people to have insurance — which lowers premium costs for those like her with pre-existing conditions. She worries, too, that the proposal might cut Medicare. “It is intentional sabotage,” she said, her words turning into white mist in the chilly November air. About 30 others stood behind her, wrapped in coats and scarves, carrying posters that said “Tax plan betrays America” and “Vote for Utahns, not your donor $.” Many waved small American flags. The rally was organized by a handful of grassroots groups formed in the wake of President Donald Trump’s election, including Utah Women Unite, Salt Lake Indivisible and the CD4 Coalition. For half an hour, participants took turns slamming provisions of the tax reform proposals, including a separate but similar plan passed in the House last week with support from all four of Utah’s representatives (all of them Republican). The Senate version, expected to move to the floor after the Thanksgiving holiday, lays out permanent tax cuts for corporations and modest tax breaks for individuals that would expire after a few years. The Joint Committee on Taxation released a report last week that suggested by 2027, families earning less than $75,000 would see higher taxes while wealthier people would pay less. And the Congressional Budget Office, the official nonpartisan analyst for Congress, found that removing the individual health-care mandate would result in 13 million more Americans being uninsured (mainly low-income and working-class individuals). “Helping low- and middle-income workers is at the heart of the senator’s tax proposal, which is why his plan would save the typical American family more than $2,000 every year,” Whitlock said in response to the rally where participants framed themselves as “the biggest losers” with the most at stake under the bill. Lindsy Cieslewicz, of Heber, opposes the plan because it replaces personal exemptions with a child tax credit. She believes that “discriminates against the children of large families” — including her own six kids. Emily Jessop, a student at Salt Lake Community College, disapproves of the proposal for eliminating the student-loan interest deduction. The roughly $930 she saves from that provision goes toward books, groceries and gassing up her Honda. Penny Larsen served five years in the Navy during the early 1980s and dislikes that the GOP legislation would scrap the work opportunity tax credit that serves as an incentive for businesses to hire veterans. And after 100 doctor visits a year, $250,000 in medical expenses and 16 joint surgeries, Mitchell relies on some leftover money, deductions and insurance coverage for rehab.